The Sun-Sentinel is reporting that rookie ILBer Austin Spitler had salmonella poisoning. Spent 2 nights in the hospital. Lost 15 pounds. Rookie CB Nolan Carroll spent a little bit of time working as the team's nickel cornerback. That's a step in the right direction. Randy Starks looked like he got winded during Saturday's scrimmaged. I'm not sure he can play more than 30 snaps right now. For the record, Dolphins OLBer Koa Misi did nothing special today, which means I'm still waiting to see him flash something. "I'm blessed to be versatile. God gave me a gift and I'm just trying to use it," said Karlos Dansby, who was dropping DEEP into coverage. Here's a difference between Donald Thomas and Richie Incognito at that LG battle. Thomas pulls much better. Gets to 2nd line of defense. Nate Garner took a few reps with the first team at left guard late in the scrimmage. He'd previously been working at RT. Nate Ness broke up an endzone pass to Roberto Wallace during the redzone work. Don't know what Ness will play (CB or FS) but he makes plays. New Dolphins TE David Martin admits he's not in ideal shape and needs to get his football legs under him. But he's the 2nd TE right now. Tyler Thigpen threw a touchdown pass in the back of the endzone to David Martin during 7-on-7 drills. 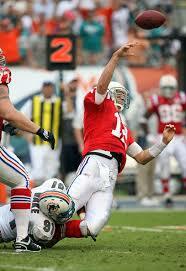 Chad Pennington's arm is clearly an issue. His balls are fluttering these days and cornerbacks get good breaks on them. ILBer Austin Spitler was back at practice after missing sessions since Tuesday. Sean Smith got to the quarterback on a corner blitz, beating FB Rolly Lombala. Cornerbacks are coming a lot. Not telling you who's dropping. Pat White had a respectable day. I didn't see it for myself, but I'm told he didn't soil his diaper during the scrimmage. Well jiggling players on D won't screw it up as bad as a pick-up offense. I like what I see. With Martin back now... I think the offense will have some serious firepower. Need to get the line set early and let those guys play together a while for teamwork etc. rookie hazing .... eat the stadium food. 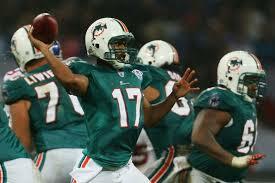 3 sacks for charles grant seems to point to issue`s with our guards not sure who it was against thomas and incognito?? think his overtaken nolan carroll on depth chart? jason allen on a thin line for roster spot??? Rook John Jerry gave up two of them. I know it's fun to single out Jason Allen because he is a former 1st rounder...But he is #1 on the depth chart at corner right now...And a good special teams player...I don't seeing him getting cut......Contrary to popular belief he is good for the team even though he isn't living up to your standards. The coaches demoted the man who started 16 games last season to second-team status. And in moving Smith down, they raised Jason Allen to first-team. You sure they didn't mean Will Allen? Jason Allen is NOT a #1 or 2 CB... don't worry about his place on the chart during camp.